Today we get acquainted with another MEGA PRODUCER from China, the home of close to 50% of the global swine production. Muyuan Foodstuff Co., Ltd was established in 1992 and specializes in hog production being the second largest Pork Producer in China. The company’s headquarters is in Neixiang City of Henan province. Muyuan was listed in Shenzhen Stock Exchange Market in 2014 and owns 90 subsidiary companies (most are swine farms) across the country. Managing over 550,000 sows, the company also owns two nationally designated GGP farms plus three GP farms with over 8000 purebred sows. Muyuan has focused on raising pigs for 25 years, all the while pioneering and innovating hog production methods in the Chinese swine production sector. Muyuan has focused on working closely with domestic and international industry leading experts to accelerate the company’s advancement in production technology and enterprise management and has as a result achieved very strong results. It Muyuan has obtained 436 national patents; it has been recognized as “the national key leading enterprise of agricultural industrialization”, “national pig live reserve base” and “national pig industry technology”. 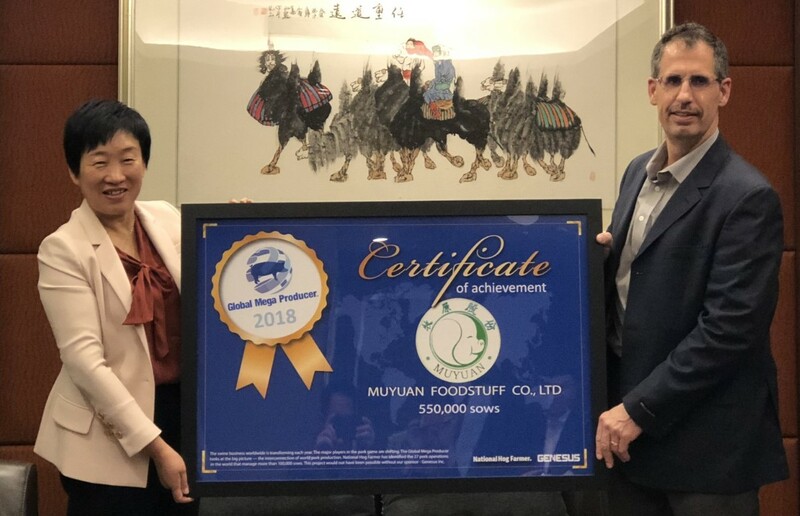 Qian Ying the chairman of Muyuan Group, receives the GMP plaque of Muyuan Foodstuff Co., Ltd., from Mike Van Schepdael Vice President., Genesus Inc.